Backed by True Hire, Background Checks for Volunteers sets the standard for providing high-quality background checks to charity and nonprofit organizations, empowering them with the answers and tools needed for a safer volunteer community. With more than 20 years of experience, True Hire has focused on providing the fastest turnaround times, excellent customer service and the most accurate information available. We have programs specifically designed for volunteer organizations, and we currently work with hundreds of nonprofits, charities and ministries all over the world. 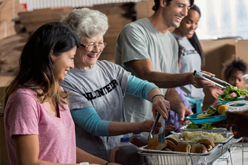 Recognizing the need for nonprofits to carefully screen their volunteers and employees on a budget, we have very specific packages to meet the needs of charities and volunteer organizations. Our applicant-pay option enables volunteers to donate the fee of their own background check directly to the organization. Ease and convenience are woven into all we do. We have many options for background check requests, results delivery, and invoicing to suit your needs. We also provide seamless integration with your organization’s applicant tracking software. You can get signed up and ready to go under an hour. While our background check process is extensive in order to protect you volunteer organization or nonprofit, the setup process is simple and economical. The staff at True Hire stands ready with the expertise and knowledge in providing invaluable information to charity and nonprofit organizations just like yours, and we’ve put together a program from start to finish that will meet all of your volunteer organization’s needs. We will be with you every step of the way, helping you interpret any results to make the best decision for your nonprofit. Your volunteer and employee applicants can go directly to our applicant center to enter the information needed to complete the background check, or we can interface with your volunteer management system. Your organization can access all completed reports directly on our secure server. True Hire is accredited by the National Association of Professional Background Screeners, an advocacy organization that sets compliance and quality standards for the background screening industry. Accreditation is a distinction held by fewer than 10 percent of background check companies. True Hire has seen significant year-over-year growth. In 2016 and 2017, True Hire received the prestigious Weatherhead 100 Award from Case Western Reserve University’s Weatherhead School of Management, which recognizes the fastest growing companies in Northeast Ohio. True Hire offers a fully-integrated drug test scheduling solution through its partnership with i3Screen. We facilitate testing with Quest Diagnostics and LabCorp, the nation’s leading providers of lab-testing services, allowing our customers to quickly schedule drug tests anywhere in the country. TransUnion’s industry-leading credit reporting tools are thorough, easy to read and competitively priced. True Hire’s integration with Samba Safety allows us to bring you instant motor vehicle record reports for all 50 states.